The British Medical Association (BMA), allied healthcare professionals and religious leaders are united in pressing for better palliative care for all. Sikh teachings emphasize the responsibility of society to care for the elderly and vulnerable, whilst making them feel loved and valued members of the community. As Sikhs we should remember the example of Guru Har Krishan, who put the care of victims of a smallpox epidemic in Delhi at greater importance than his own life. The importance of ‘assisted living’ and caring for those around us is central to Sikh teachings. All Sikhs should lobby the Chair of the APPG for Sikhs, Rob Marris (whose majority is only a few hundred) to withdraw his ill-considered and demeaning bill. The undeniable strength of the Sikh Federation on the APPG could be particularly helpful. All Sikhs should lobby other members of parliament not to support a Bill that cuts across our responsibility as human beings and the whole thrust of Sikh teachings to assist vulnerable people to live with dignity and good palliative care. My Lords, I too pay tribute to the noble Lord Alton for securing this important debate, and for his sterling work in putting concern for human rights high on the agenda of this House. Article 18 of the 1948 UN Declaration is unambiguous in its guarantees of freedom of religion and belief. Yet we live in a world where all too often those rights are all too frequently ignored. Where have we gone wrong? In commerce or industry if a clearly desirable idea or initiative fails again and again, it’s back to the drawing board. Today we need to ask ourselves, why the widespread abuse of the right to freedom of belief? This important right, like others embedded in the UN Declaration, needs the total commitment of countries with political clout to make it a reality. Unfortunately, even permanent members of the Security Council, frequently put trade and political alliances with countries with appalling human rights records, above a commitment to rights. There are many examples, but time permits me to mention only a couple relating to our own country. During the visit of a Chinese trade delegation in June of last year, a government minister said ‘we should not allow human rights get in the way of trade’. His statement undermining the UN Declaration, went virtually unchallenged. At about the same time, we had a statement in your Lordships House that the government was pressing for a UN led inquiry into human rights abuse in Sri Lanka. Fine. 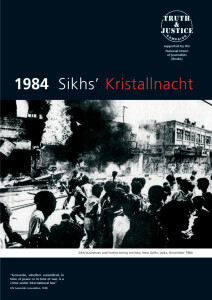 But when I asked if the government would support a similar inquiry into the mass killing of Sikhs in India (a bigger trading partner), I received a brusque reply: ‘that is a matter for the Indian government’ I have asked the same question on five occasions: why does the UK government regard the systematic killing of Sikhs in India to be of no concern, only to receive the same dismissive non-response. My Lords, I ask it again today, and hope your Lordships and Britain’s half million Sikhs will get the courtesy of a properly considered reply. The great human rights activist rightly said that we must be even- handed in looking at human rights abuse. My Lords, if our country, one of the most enlightened in the world, puts trade above human rights, it is easy to understand why other countries turn a blind eye to rights like freedom of belief; a right so central to Sikh teachings that our 9th Guru , Guru Teg Bahadhur gave his life defending the right of Hindus, a different religion to his own, against forced conversion by the then Mughal rulers. My Lords, we can list human rights abuse forever and a day without it making a jot of difference, if we and other great powers continue to put trade and power block politics above human rights. We start each day in this House with prayers to remind us to act in accord with Christ’s teaching. He, like Guru Nanak reminded us never to put material gain before concern for our fellow beings. We need to act on such far-sighted advice.